London, UK: 12 December 2017 — The Maggie’s Centre Barts, designed by Steven Holl Architects in partnership with jmarchitects, celebrates its opening today. Maggie’s Barts, sited in central London, will provide free practical and emotional support for people living with cancer and their family and friends. A three-story “urban townhouse,” the new Centre has been designed to be full of open space and light. The exterior works in harmony with the interior, allowing natural light to wash over the floors and walls, ever changing through the natural daylight pattern of the seasons. The building is envisioned as a “vessel within a vessel within a vessel.” The structure is a branching concrete frame, the inner layer is bamboo and the outer layer is matte white glass. The exterior glass with colored glass fragments is organized in horizontal bands like a musical staff, recalling “neume notation” of Medieval music of the 13th century. The word neume originates from the Greek pnevma, which means “vital force.” It suggests a “breath of life” that fills oneself with inspiration like a stream of air, the blowing of the wind. 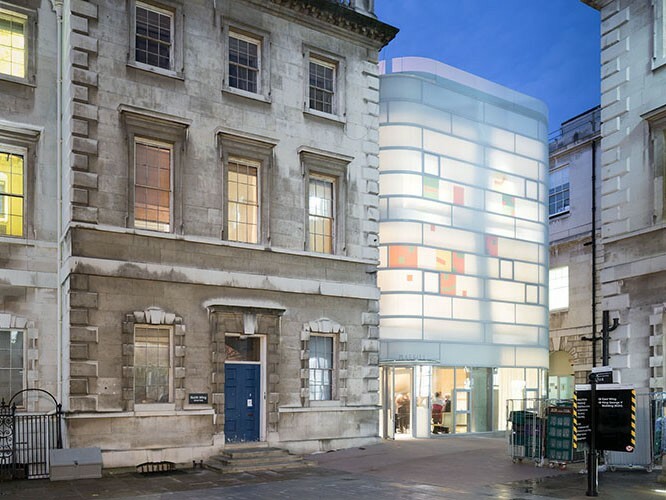 The new type of polychrome insulating glass was developed especially for the Centre by Steven Holl Architects in close collaboration with glass manufacturer Okalux. The glass facade geometry follows the geometry of the main interior stair along the north facade, while lifting up with clear glass facing the main square. Inside, the open curved staircase is integral to the concrete frame with open spaces vertically lined in bamboo. There is a second entry on the west opening to the extended garden of the adjacent church. The building tops out in a public roof garden open to a large room for yoga, Tai Chi, meetings etc. The garden will be open to patients, staff and the public and will be maintained by Maggie’s. The interior character of this building is shaped by colored light washing the floors and walls, changing by the time of day and season. Interior lighting is organized to allow the colored lenses together with the translucent white glass of the facade to present a new, joyful, glowing presence on this corner of the great square of St. Bartholomew’s Hospital. Layers of history characterize this unique site, connecting deeply to the Medieval culture of London. The site in the center of London is adjacent to the large courtyard of St. Bartholomew’s Hospital. Founded in Smithfield in the 12th century, the hospital is the oldest in London and was founded at the same time as the St. Bartholomew the Great Church in 1123. Rahere founded the church and hospital “for the restoration of poor men.” The new Maggie’s Barts replaces a pragmatic 1960s brick structure adjacent to a 17th century stone structure by James Gibbs, holding the “Great Hall” and the famous Hogarth staircase. With advances in medicine and earlier diagnosis the chances of surviving cancer long term is double that of 40 years ago. As the number of people living with cancer increases, so does the need for practical and emotional support to cope with the challenges that living with and beyond cancer brings. Working in partnership with Barts Health NHS Trust, the new Maggie’s Centre will offer a way of living well with cancer for the 5,500 new cancer diagnoses Barts sees each year. Maggie’s relies on voluntary donations to support and grow its network of Centres across London and the UK and to develop its unique, high quality program of support. For further information and to ensure Maggie’s continues to provide its program of support please visit www.maggiescentres.org/barts and help make the biggest difference possible to people living with cancer and their family and friends across the capital. •Maggie’s offers free practical and emotional support for all people living with cancer, and their family and friends. Built in the grounds of specialist NHS cancer hospitals, Maggie’s Centres are warm and welcoming places, with qualified professionals on hand to offer a program of support that has been shown to improve physical and emotional well-being. •Great architecture is vital to the care Maggie’s offers; and to achieve that Maggie’s works with great architects, whose expertise and experience deliver the calm, uplifting environments that are so important to the people who visit and work in the Centres. •The first Maggie’s Centre opened in Edinburgh in 1996. There are now 23 Centres across the UK and abroad, with more planned for the future. Maggie’s also has an Online Centre. •Maggie’s relies on voluntary donations to support and grow its network of Centres and to develop its unique, high quality program of support. The charity’s aim is to make the biggest difference possible to people living with cancer and their family and friends. •2017 marks Maggie’s 21st anniversary. •Maggie’s President is HRH The Duchess of Cornwall.